Prince Orlofsky's costume ball is the event of the year. 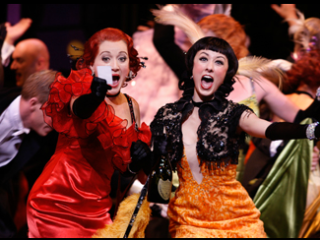 The over-the-top party plans to surprise and delight its guests — and everyone watching — with witty and zany characters who create all the action in this opera written by Johann Strauss. With serenades, a famous Hungarian csárdás and waltzes to the score "Waltz King," this deco-inspired setting invites the audience to join the clever and sophisticated fun. The cast includes Liam Bonner as Eisenstein, Wendy Bryn Harmer as Rosalinde, Laura Claycomb as Adele, Susan Graham as Prince Orlofsky, Anthony Dean Griffey as Alfred and Michael Sumuel as Frank.